Sold Out! This pin is exclusive to the Pink Wings website. It is our 2014 Walk pink ribbon pin. 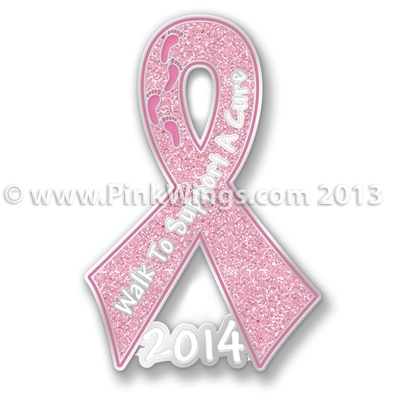 The pin is 1 1/4" tall with a light pink glitter ribbon and the words Walk To Support A Cure. There are 4 little feet at the top of the ribbon and 2014 at the bottom.